He exited the glass double doors and walked away from the building. Inside, his fellow Pittsburgh police officers lined the hallways of the veterinary office, some in their uniforms, others sporting green canine unit sweatshirts, as he was. They had just lost one of their own — and Officer Lerza had lost his partner. Canine Rocco died at 6:17 p.m. Thursday at the Pittsburgh Veterinary Specialty & Emergency Center in Ohio Township “after a good fight,” Zone 2 Cmdr. Eric Holmes said. The 8-year-old German shepherd was stabbed Tuesday night while apprehending a suspect. Read more: Pittsburgh police dog Rocco remembered as a hero – Pittsburgh Post-Gazette. The next time you’re lost in the wilderness, trying to figure out which way is north, forget about moss growing on the side of a tree. Just pay attention to how your dog poops. He’s a regular canine crap compass. Okay, that is a vast oversimplification of two years’ worth of study by a group of German and Czech researchers, but it illustrates how much we’re still learning about the mysteries of man’s best friend. It turns out that when he squats to defecate, your dog may be communing with the unseen lines of magnetism that girdle our planet. Read more: Watching them poop, researchers discover that dogs can sense which way is north – The Washington Post. Lancaster PA — Chase apparently stayed in the woods for more than a day, barking to draw attention to his owner, who lay dead in the snow. Now, the family of Claudine Louise Murphy, a Brecknock Township woman who likely died of hypothermia sometime Saturday, is trying to find a good home for the devoted pooch. 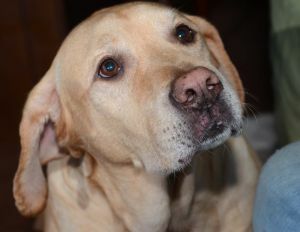 “Chase was not on a leash, he was just walking beside her,” said Nancy Althouse, who lives nearby and who first rescued Chase, a mixed yellow Labrador retriever, from a bad living situation some nine years ago. Read more: Loyal dog, stayed with deceased owner in woods for more than a day, needs home – LancasterOnline: Local News. (CNN) — When animal control officers were called to a Greenville, South Carolina, neighborhood to pick up a wandering pit bull on a cold Monday in December, they didn’t expect a mystery to unfold. But inside a fold of the dog’s collar, they found a wrinkled black-and-white photo. It had no name or date. A smiling man seated on a railing looks straight into the camera — but, beyond that, the photo offers no clues. The friendly tan canine, now named Soldier because the man in the photo may be wearing a military uniform, was skinny but well-behaved, said Susan Bufano, community relations coordinator with Greenville County Animal Care. He was not neutered or microchipped. 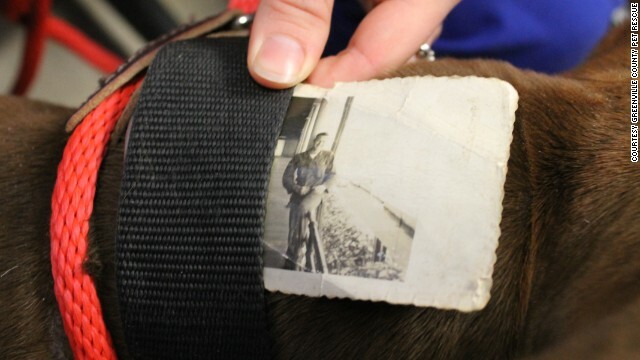 Read more: Mysterious photo found in dog’s collar – CNN.com.